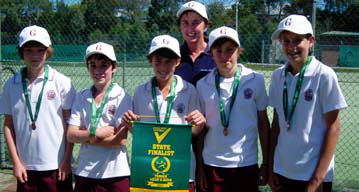 Congratulations to Galen’s 2011 Year 7 boys’ tennis team, (consisting of Matthew Wilson, Sam Harvey, Zac Sullivan, Fletcher Stewart and Harry Condon) who finished third in the state VSSSA competition. The boys ultimately fell short at the last hurdle, when they were beaten in Melbourne by sports high school, Maribrynong College and Glen Waverly Secondary College. Thanks to Mr Robert Freyer, grandfather of Matthew for driving the bus, Mrs Deb Stewart for generously providing embroidered caps for all the team (including the coach! ), and to the following family members and friends who travelled to Melbourne to support the boys – Robert and Dianne Freyer, Barry and Maree Sullivan, Deb Stewart, Paula Wilson, Beverly Harvey and John Voss. Congratulations to the boys, who all displayed great sportsmanship during every match they played and who were terrific ambassadors for Galen. I was very proud to be involved with you all.